07 Apr1Q 2017 — Is the Market Rally Long in the Tooth? Despite market participants taking money off the table in March, the S&P 500 Index returned 11.3% from the November U.S. election through the end of the first quarter. The day after President Trump’s inaugural address, investors put $8.1 billion dollars into the SPDR S&P 500 Index which was the biggest buying surge since December 2014. Strong leading indicators and rising earnings growth suggest the upside may continue although it’s hard to ignore the market multiple in the eighth year of this bull market. The S&P 500 Index currently trades at 21.7 times trailing twelve month earnings and 18.1 times forward twelve month earnings which is a healthy premium to the 10 year historical average of 15.3 times and 13.9 times respectively. Despite these valuations, S&P 500 Index earnings growth is set to rebound in the first quarter rising an estimated 10.2%, which would be the highest growth rate since fourth quarter 2011. With the earnings recession in the rear view mirror, there may be more upside for high quality dividend growers. A stronger economy, improving earnings growth as well as positive fiscal policies in the areas of tax reform, infrastructure and deregulation could help propel the markets higher. President Trump’s foiled health care plan has caused some consternation about the future success of the administration’s overall agenda but, chances are, several of his policies will gain enough traction to be implemented. One industry that stands to benefit from regulatory relief is Financials. The sector has faced headwinds from low loan and mortgage growth coupled with lower volume. Going forward, rising rates and increased earnings estimates should benefit the sector. 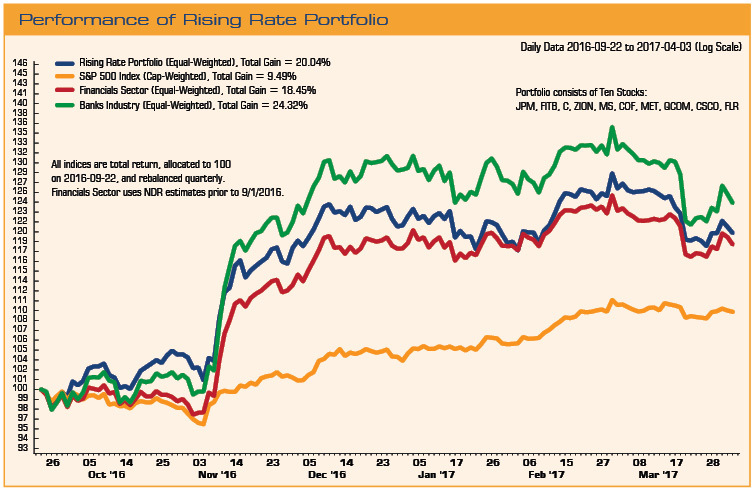 The chart below shows a basket of “Rising Rate” stocks primarily consisting of financial and bank stocks which have outperformed the S&P 500 Index since the election despite the pullback in March. Since not all dividend stocks are alike, we emphasize the importance of being selective when investing in “bond proxy” sectors, which can be negatively impacted by higher rates and increasing inflation such as Telecom and Utilities that have difficulty passing on increased cost to the consumers. Over the next six to twelve months, sector valuations will also be important as several bond proxy sectors such as Staples and Utilities are overvalued versus Financials and Energy. In the first quarter, the top performing sectors in the Navigator High Dividend Equity portfolio were Technology up 12.1%, Consumer Discretionary rising 8.0% and Healthcare up 7.8%. 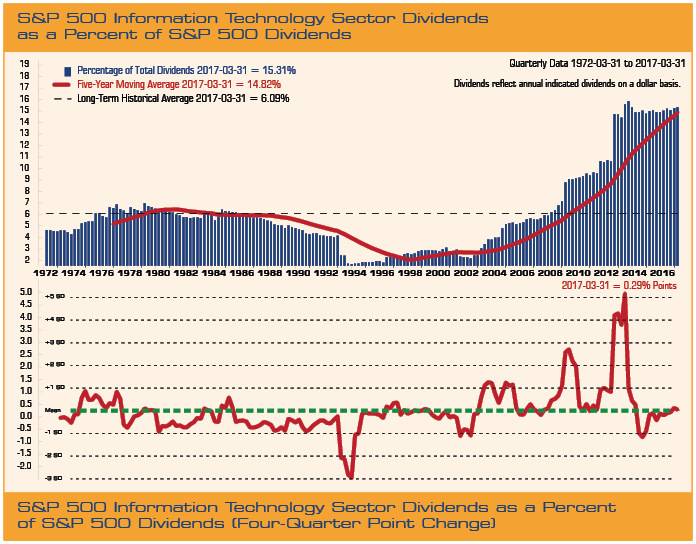 Currently, the Technology sector contributes on average 15% of the total S&P 500 Index dividends versus their historic average contribution of 6.0%. We believe the increased dividends along with rising earnings estimates makes it an attractive sector for dividend growth stocks. The lowest return sectors included Energy down 7.3%, Telecommunications declining 5.0% and Financials up a mere 2.0%. The Energy sector will experience positive earnings versus a first quarter loss a year ago although that has yet to be reflected in stock prices. The strongest earnings were in Financials up +15.9%, Technology +14.3% and Materials +11.5% versus the lowest earnings which were found in Real Estate +1.4%, Utilities +1.3% and Consumer Discretionary +1.3%. In the Navigator High Dividend Equity portfolio for the quarter the Technology sector had the biggest movers including Apple up 24.0%, Broadcom rising 23.8% and KLA-Tencor up 20.8% while the biggest losers were Chevron down 8.7%, Whirlpool falling 5.7% and International Paper declining 4.3%.